Luca's Cube is made by eight pieces of the same volume but having different shapes. The pieces are generated from a cube by detaching a prism and then gluing it back in different positions. 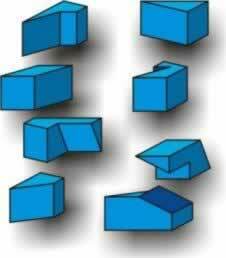 Pieces can have 104 different shapes but only 72 are likely to be used in this puzzle. Versions with 27 or 64 pieces are much more difficult to solve. To solve the puzzle the pieces must be arranged to obtain a cube or any other symmetrical shape. The average time to solve the 8-piece puzzle should not exceed 30-40 minutes. Submitted by terra on Mon, 2008-12-29 11:12. Submitted by gevard on Mon, 2008-12-29 00:00. I find very interesting information at this article, thanks.